The 'Scottish Government Policy on Introductions of Fish to Scottish Inland Waters' can be found here. Consultation on proposals to introduce a charging scheme under the Reservoirs (Scotland) Act 2011 and the Reservoirs (Scotland) Regulations 2015 - link here. For more information contact: Dione@sanaladies.co.uk or Kathleen@sanaladies.co.uk. 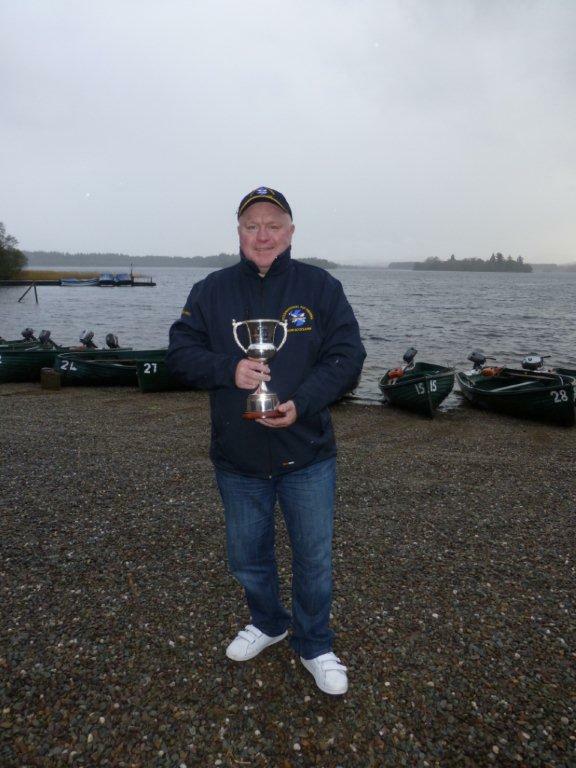 30 anglers competed at Lake of Menteith on Monday 4th August for both the Singles and Pairs SANA Open. The competition is fished on a total catch and release basis. 135 fish were caught with a rod average of 4.5 fish per angler. 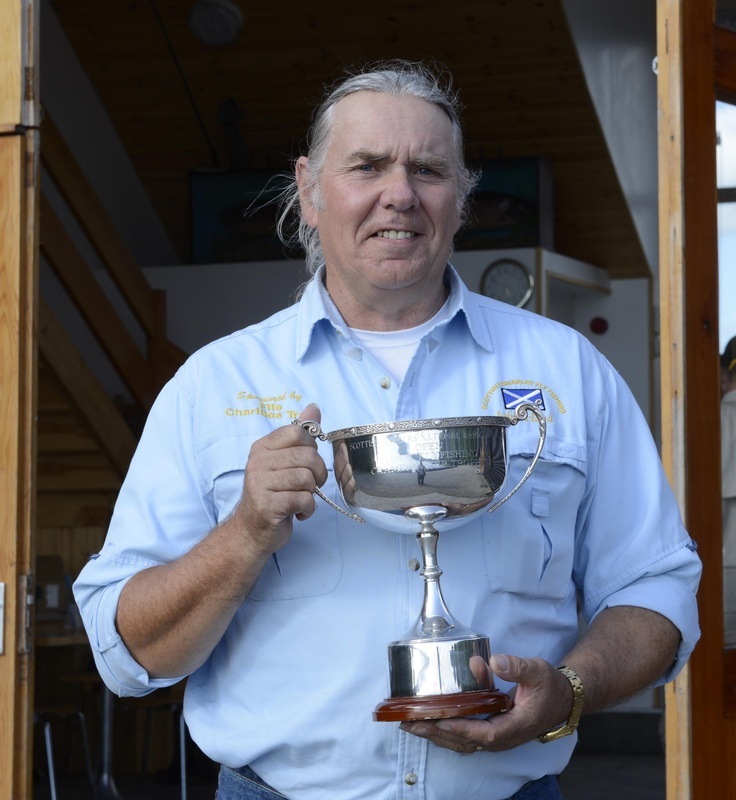 Top individual was John Hood, SANA's own Angling Development Officer, who had 11 fish. Top Pair were Tam Findlay and Alastair McGillvray. Many thanks to all that entered. The full results are available here. SANA has received the message below from Kelsey Baird. Currently based in Scotland she aims to collect data via face to face interviews with anglers or by snail-mailing paper surveys to them c/w a prepaid return envelope. Anyone willing to take part in her survey should contact Kelsey by phone at 07523282443 or by e-mail at kabaird0@frostburg.edu and provide her with a mailing address. She says she is conducting her study from a neutral standpoint. She welcomes any and all forms of thoughts and views, and does not wish to skew or inhibit any attitudes expressed through the survey. This is an academic study and any subsequent publications will truthfully reflect the responses given, with all responses remaining anonymous. My name is Kelsey Baird, and I am a Masters student in Applied Ecology & Conservation Biology at Frostburg State University, Maryland USA. I am trying to conduct the first formal assessment of angler attitudes towards otters and piscivorous birds in Scotland as part of my thesis. Having Grown up in Scotland and graduated from the University of Stirling with a B.Sc Hons. in Environmental Science & Biology, this is a very exciting and special project that I feel privileged to be able to personally conduct. 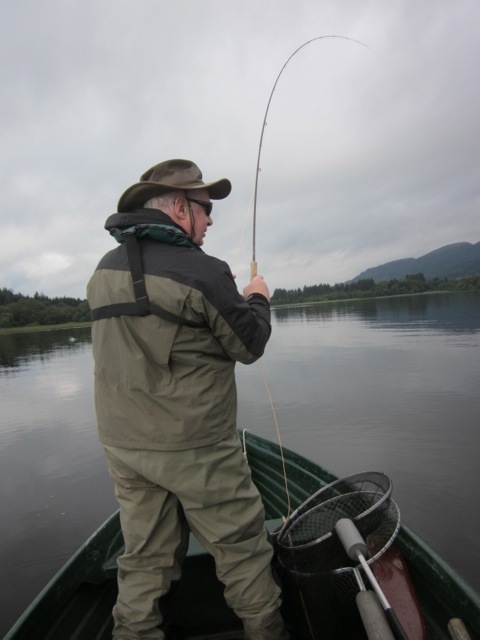 I am interested in the thoughts on and experiences of all anglers while fishing in Scotland, and I am trying to get in contact with as many anglers as possible to complete my survey while I am here in Scotland. I would greatly appreciate it if you would consider participating in my study and possibly help me to get in touch with a wider range of anglers. I am prepared to send surveys with prepaid return envelopes to willing participants, and I am also open to any advice or thoughts on how to better conduct the study. I aim to publish my thesis and hope to make a real contribution towards the conservation of Scottish salmon and trout, as well as more effective conservation management of piscivorous wildlife. Overburns Farm Quarry - It transpires that Paterson's are appealing the Government Reporter’s decision to reject their earlier appeal on the grounds that he “erred in law” Latest news can be found here. Check Clean Dry – Stuart Crofts has had articles on non-native species published widely in the angling press recently. 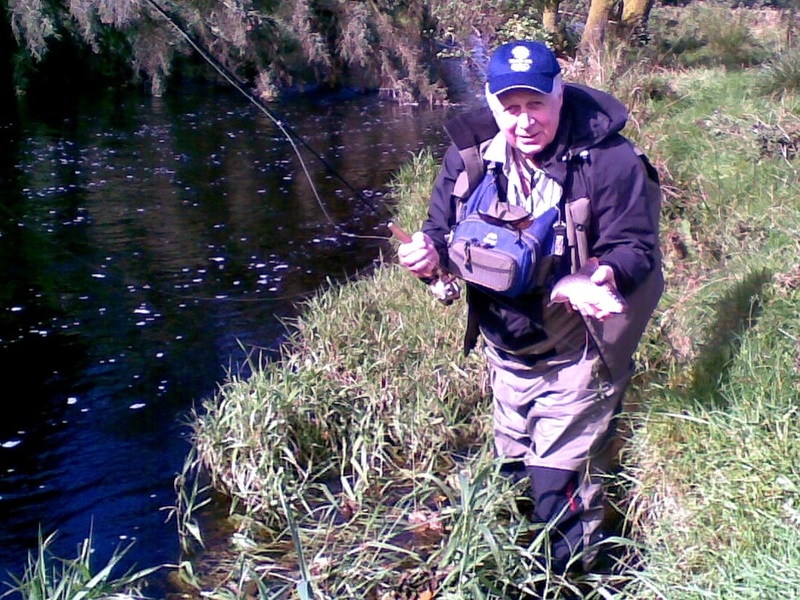 His main message is that ALL anglers (and other water users) must be won over to take the topic seriously, and ensure they dry off all tackle and kit before travelling and using it in other water courses. Its only a matter of time before invasive shrimps reach Scotland, but anglers can make things hard for the beasts if they check clean and dry after each fishing expedition. Details can be found here. The belligerant beaver - story can be found here. The results of the recent survey can be found here. The SANA AGM will be held on Sunday the 2nd February 2014, at 10.30 am in the Green Hotel, The Muirs, Kinross KY13 8AS. All Members and Member Clubs are invited to attend or be represented at this important meeting. The following reports will be presented at the AGM and are available below for the convenience of all. May with boats sponsored by Lake of Menteith Fisheries. Many thanks for the continued generous support. her team at the lodge for the excellent catering for everyone. New Champion is Jim Curry from Irvine. The top seven rods plus 1 reserve will present SDFFA Team Scotland at Eyebrook in England in 2014. The full team in order are Jim Curry, Wullie Brash, Fraser Renwick, Tom Ward, Wullie Fulton, Bill Barnes and Tony Lithgow. Graham Steele is travelling reserve. Full results can be seen here. Result is by weight, 3 fish weighed in and 2lb per fish returned. The SANA AGM will be held on Sunday 3 February 2013 at 10.30am in the Green Hotel, The Muirs, Kinross. All members and Member Clubs are invited to attend or be represented at this important meeting. The following reports will be presented at the AGM and are available below for the convenience of all. Further information about the AGM may be obtained from the SANA Secretary, or by calling the SANA Office on 01577 861116. As noted below, the 2013 SANA AGM will be held on Sunday 3rd February 2013 in the Green Hotel Kinross. The calling notice for the AGM is below. The paper copy of the AGM Calling Notice and Agenda sent to SANA members contains a typo in connection with the date of the meeting. For the avoidance of any doubt, the meeting is on 3 Feb 2013. A corrected calling notice and apology has been issued, with an apology from SANA. The SANA Accounts for the period ending on 31 Oct 2012 will be presented at the AGM. These accounts are available below. SANA is delighted to see this article in the Carluke Gazette. SANA has played a full part, primarily through the Non-Migratory Fish Committee, in opposing the plan for the establishment of a quarry at Overburns Farm. SANA has supported the Clyde River Action Group and is delighted that this planning application has been rejected for a third time. This is a fine example of the part SANA can play in the protection of the aquatic environment. Please continue to support your National Anglers Association. The President, Donald Forbes, and the Chair of the Migratory Fish Committee, Craig Campbell, have approved SANA's submission to the Land Reform Review Group. The submission can be found here. More information on the Land Reform Review Group can be found here. SANA has responded forcefully to publication of the Aquaculture and Fisheries (Scotland) Bill. This is at stage one of the parliamentary scrutiny by the Rural Affairs, Climate Change and Environment Committee. Craig Campbell, Migratory Policy Committee Chairman said: "This is the first real chance for the interests of wild fish and of fish farming to be properly balanced. We've told the Committtee that lowest cost farm production of salmon imposes unacceptable burdens on the natural environment which severely damage wild stocks of salmon and sea trout. The central purpose of the Bill should be to encourage the industry to “up its game”, through innovations that mitigate its impact on wild fish. "Additionally, the Bill does not exclude rod licensing from the proposal for wide ranging powers to implement charging through secondary legislation. SANA supports the current method of funding District Salmon Fishery Boards and would oppose a direct levy on anglers by central government. Such a levy would be a disincentive to participation in a healthy outdoor recreation which is second only to walking in Scotland. Also, it could be expected to impact seriously on jobs and businesses which are dependent on the many visitors to Scotland whose principal interest is angling." The SANA response in full is here. A paper produced under the auspices of the SANA Migratory Fish Committee (MFC) which has an analysis of salmon and sea trout catches to determine the true impact of netting on fish populations is here. Please send any feedback to the webmaster who will direct these to the MFC. Earlier in the year, I got an email from David Ogg saying that he’d been contacted by an ex-pat Australian, Alan Madden, who was looking for fishing contacts in Scotland in advance of an extended visit. David had responded that he would host Alan on the Lake of Menteith (see story below), and asked me if I would lay on some river fishing. Arrangements were duly made. My wife Jean and I have a caravan at Pitlochry, and Alan, with his wife, Irina, stayed with us on their way back to Glasgow from a sojourn in the Highlands. 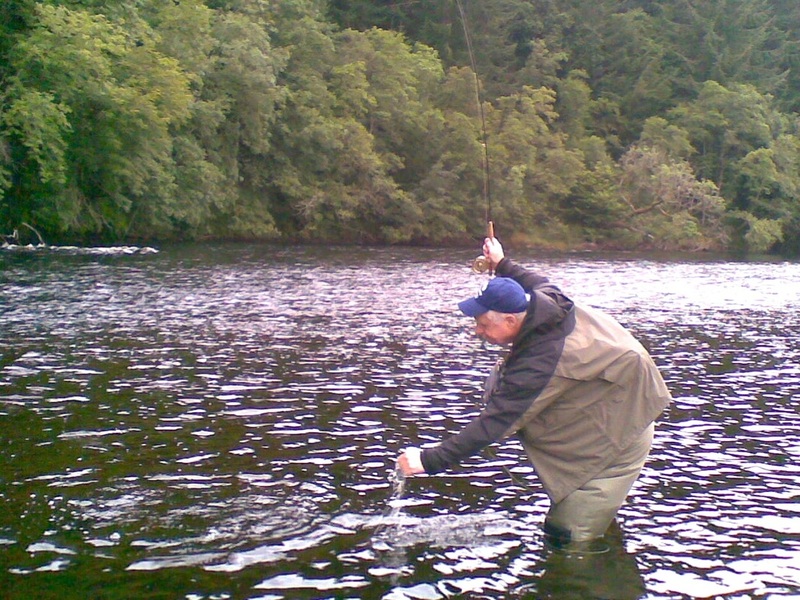 Alan and I planned a day’s dry-fly fishing on the Tummel. Alan is more enthusiastic and improving late-starter than seasoned angler, but his Lake trip with David had started with a fish for him on the first cast – a hard act to follow! I couldn’t beat that, but Alan did catch a nice brownie within the first five minutes, and was duly delighted. The Tummel is not a river which gives over-generously of its bounty, however, and after some promising initial action, sport was pretty slow for much of the rest of the day. With almost nothing rising, Alan did well to finish with three or four nice fish. Tired but happy, and with ‘rubber legs’ from the heavy wading, he told me that the Tummel was a somewhat larger and more intimidating river than those he was accustomed to fishing at home in Australia. After Alan and Irina had settled into their accommodation in Glasgow, we arranged a further river outing. I had hoped to take him onto the upper Clyde, but with water levels everywhere on the high side, and strong winds forecast for the week, I took him onto a couple of tributaries instead. 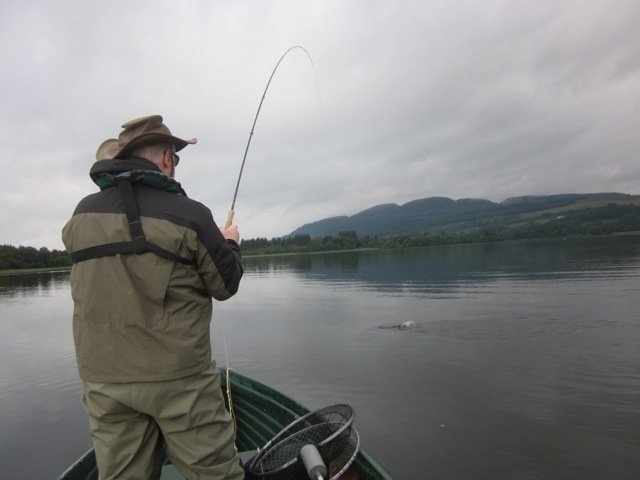 Although the fishing was not at its absolute best, there were many more opportunities than on the Tummel for Alan to cast for rising fish, and we had a very enjoyable day on the smaller waters. Alan caught two beautifully-conditioned grayling, his first ever, and a species not available to him in his home waters. Some nice trout, albeit of modest proportions, also came his way. Given the conditions, we might have been able to catch more and perhaps bigger fish on other methods, but Alan was keen to persist with the dry fly, and there was just enough surface activity to keep us amused. I hope, as I’m sure David does, that we have helped to add some pleasant memories to a trip which I think Alan felt would probably be his last to the ‘Old Country’. We are delighted to make this document, A Survey of Catch and Release in Stocked UK Stillwater Trout Fisheries available to our members and friends. The survey may be downloaded in the form of a PDF file by clicking here. The survey has been conducted my Messrs C Vaughan Ruckley, Eric J Fox and Bob Perrett. Should any member have any comment on the survey please email the SANA webmaster who will arrange to pass any comment to the authors. The World Championships website is here. The Scottish Team finished in 13th place after the 5 sessions. 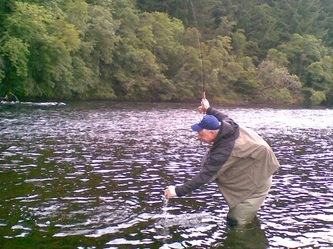 Jake Harvey was the top Scottish rod, finishing in 16th place. Well done to all involved. Report and pictures available here. There were 8 qualifiers from Swanswater on Saturday 26th May. First place went to Alan Buchan and the remaining qualifiers were John Morton, Darren Hill, Ronnie Codona, Dougie McLean, Peter Ferrier, John Johnstone and Malcolm Miller. 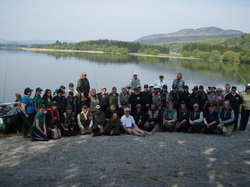 Photo left - All the teams from the Ladies International at Lake of Mentieth and Douglas.Scottish Team members were Elaine McCracken, Gail Annall, Abigail Montgomery, Dione Roberts, Jane Wright, Kathleen Shepherd, Kellie McNie, Liz Fraser, Marion Wallace, Morag Wallace, Nikki Ross and Wendy Mitchell.Wendy Mitchell was top Scottish Rod 15lbs 9oz. 2 anglers, Andrew Barrowman and Glen McHattie qualified from the heat at Lochter. The heat at Mid Mar fishery has been cancelled. The final 2 heats are now closing in. Swanswater Fishery in Stirling is holding their heat on Saturday 26th May. To reserve your place contact the fishery on 01786 814805 and the final heat is an evening session at Glen of Rothes telephone 01340831888. 6 anglers qualified from this heat. First place on his first attempt this year was Willie Riddicks, the other qualifiers were Stephen Cowan, Stephen Dallas, Ken Anderson, Grant McCauley and Jim Edwards. Congratulations to them. We now move north for the next 2 heats. Next Saturday the Heat is at Lochter and the following week at Mid Mar. Full details on the remaining heats are available on the competitions page. Full results for New Haylie are here. Halfway point of the National Championship has been reached and another 3 anglers have qualifed for the final. Today's winner was Alan Smith 7 fish and 11 points then Stuart Fraser with 6 fish for 11 points. Alan's 1st fish was earlier. There were 4 anglers tied on 9 points therefore time of first fish came into effect and final qualifier was David Bullen. On an extremely cold day it was great credit to all the anglers who all caught fish. Results from Markle are here. Please note at the fishery Stuart was called first but the official has since checked the scores and Alan Smith was first, there is no change to the qualifiers. At half way stage there are 23 qualifiers so far. 76 anglers have taken part from first 5 heats Full list of finalists is here. Next heat is at New Haylie Fishery this coming Saturday 5 May. To book a place please phone 01475 676005. Robert Watson, Billy Scott, Tony Pryde and Graham Ferguson. Full result can be found on our competitions page. 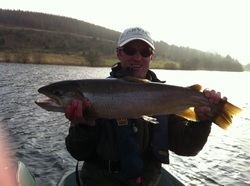 Second round of the SNFFL Premier League was held on Sunday 22nd April on River Tweed. Here are those results and here is the Leaderboard after 2 events. 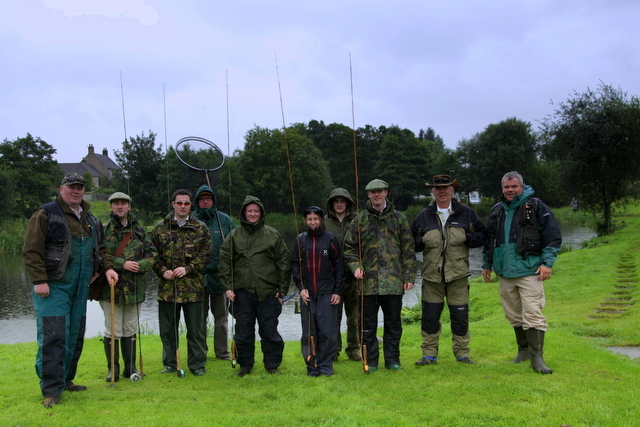 The second event of the SNFFL 1st Division was held on Sunday on the River Tweed. Here are the results and the leaderboard after 2 events. Further information and entry criteria for the SNFFL Leagues can be found on our competitions page. 3 anglers qualifed from the heat at Craufurdland today, Saturday 14th April. Congratulations to heat winner Andy Dunning, John Anderson Jnr and Joe Morrison. Full result for this heat are on the competitions page. There were 5 qualifiers from this heat which was won by Richard McHattie. The 5 qualifiers were Richard McHattie, Kenny Riddell, Steve Corsar. Grant Osler and Colin Martin. Full results are available now on the competitions page. There are still places available at Craufurdland this coming Saturday. To book your place phone the fishery on 01560 600760. Date Saturday 24th March. Measured 76cm and was safely returned. 24 anglers competed at Allandale Tarn. 7 anglers qualified for the final from this heat. This included 2011 National Champion Stuart McCormick. The 6 qualifiers are Kevin Andrews, Stuart McCormick, Robert Anderson, Jim Skilling, Alec Bowler, Willie Brash and Derek Russell. The full result is available on the competitions page. Our Thanks got to Iona and Margot at Allandale Tarn for once again allowing us to use their fishery. The next heat is at Kingennie Fishery, Dundee next Sunday 8th April. Full list of venues and their contact details are here. 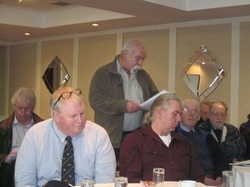 The SANA AGM was held on 25 March 2012. A resume of the meeting and of the decisions made is here. The SANA Financial Director has asked that this detailed explanation of the accounts presented to the AGM be made available on this website. The financial report is available in the 2012 Handbook, which can be accessed here. I am delighted to be able to report that yesterday, Tuesday 27 March 2012, the planning committee of South Lanarkshire Council unanimously voted to refuse planning permission to SLR on behalf of Paterson's of Greenoakhill for a sand and gravel quarry adjacent to the banks of the Clyde at Lamington. This was the second application subitted by them in a 27 month period. It was noted by the chairman that the quality and content of the objections was of a very high standard and that the campaign conducted by the umbrella group, Clyde River Action Group, was very focussed, professional and considered. To everyone who submitted letters of objection or provided advice and support, thank you. The First Heat at Allandale Tarn on 31st March is now full. The next heat will be at Kingennie Fishery, Sunday 8th April. To reserve your place please contact the SANA Office 01577 861116 or call the fishery. Contact details for all fisheries and dates for heats can be found here. SANA has been asked to make this report available on the website. This indepent study attracted participation from 198 fisheries, of which 60 were in Scotland. The report is here. Members or friends wishing to comment should do so via the webmaster. SNH has commissioned Why Research to carry out a survey designed to tell SNH what members of the public and those who deal with the organisation think of the way that wildlife is managed in Scotland. It is also designed to tell SNH what people who deal with the organisation think of the level of service they provide. All views and opinions are important to SNH and Why Research would appreciate it if you could take a few minutes to complete the questionnaire and give us your views. SDFFA are holding 2 fundraisers in support of the SDFFA Team who are aiming for a 3rd consecutive Gold medal at Lake of Menteith in June. Full details on the events are available on this website here. As announced to SANA members and member clubs in October, the SANA President, David Ogg, is unable to stand for re-election at the AGM on 25 March 2012. The SANA Board would be interested in hearing from SANA members or prospective members who may be interested in filling this appointment. A precis of the duties of the SANA President is here, and prospective candidates may wish to discuss the appointment with David or with the SANA Administrator, Andrew McIntosh. Email contact details for David are here and for Andrew are here. The SANA MFC response to the Scottish Government's proposed Aquaculture and Fisheries Bill was endorsed by the SANA Board on 1 Feb 2012 and is here. At a meeting on 1 Feb, the Board agreed that there was merit in this idea and, to move the idea forward quickly, that SANA move to identify individuals to act as regional foci, with a view to discussing with them how the idea might work. Any SANA individual or club member, or individual who would be be prepared to join SANA, who would wish to act as a regional focus is asked to contact the SANA Administrator or Webmaster in the first instance to discuss such issues as area of responsibility, issue reporting and contact arrangements. This is an idea in progress and will develop as the membership sees fit. Please help to make it successful. The SANA AGM will be held on 25 March 2012 as previously announced on this page. The following deadlines are reproduced from the SANA Articles of Association, which are available in full here. Business and motions to be brought before the meeting have to be intimated by the members 8 weeks before the meeting. This means that if a member wants to propose a motion (for example to change the Articles) then they have to submit it 8 weeks before the AGM. Nominations by the members for elections to the Board must be lodged with the company secretary 6 weeks before the AGM. Again, this applies if a member wants to propose a person to be a director. The Notice of the AGM needs to go out either 21 or 14 days before the AGM (depending on whether or not a special resolution has been proposed). The Proxy Form should also be sent out along with the Notice. SANA members should note that we are now within the 8 week notice period required for formal business and motions. However, the SANA Board will consider any matter for discussion at the AGM if submitted by members up to 2 weeks before the AGM. The note above means that such matters may not be in the form of a formal motion. Please address any queries on these matters to the Administrator. SANA would like to appoint a Director of Coaching. The job specificiation is here. Please apply by email to the SANA Administrator here. Applications should be in letter format, detailing experience relating to the job specification. The closing date for applications is Sunday 19 Feb 2012. Any queries should be addressed in the first instance to the SANA Administrator. The challenge of getting the SANA message across despite the plethora of information available on the website and published in the annual handbook. Increasing membership and explaining the benefits of SANA membership. The benefits of SANA membership are identified here. Making access to coaching for member clubs easier. Making regular contributions to the angling press to assist in getting the SANA message across. Publishing a paper on running catch and release competitions. The Marine Scotland guide to best practice in catch and release is here. Identifying a lead fundraiser to head a fundraising committee. Applicants may apply here. Other fundraising ideas floated including Clubs giving consideration to levying members (say £1) in support of a specific SANA activity (e.g., Youth Team) and contacting CEOs of leading Scottish companies. Essential to treat fundraising as a major issue. There was unanimous agreement that the appointment of a Coaching Director remained a high priority. There was unanimous agreement that the Organisation requires a Publicity and Press officer. there was some discussion about adopting a regional structure, with regional representatives, which will be further considered by the Board. SANA is currently organised on functional lines and any change to a regional structure would be a major departure. It was suggested that SANA could make better use of email communications with members and member clubs. It was reiterated that SANA needed to spell out its role very clearly to members and potential members, differentiating between SANA and SANACC. Last, but by no means least, there was pretty lengthy discussion (at different points during the meeting) on the vexed issue of Youth Team sponsorship. Many of those present voiced sincere and heart-felt opinion and it was to everyone's credit that all views were heard. It was clear that there was no outright majority on one side or other of the argument but one individual later suggested to me that the meeting seemed to be split around 60/40 in favour of the current arrangement. The thanks of the SANA Board go to all who contributed so positively - progress updates will be reported here. 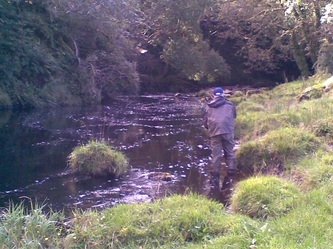 There are still a few places available in the 1st Division of the Scottish National Fly League 2012, details on criteria are here and interested parties can apply here. 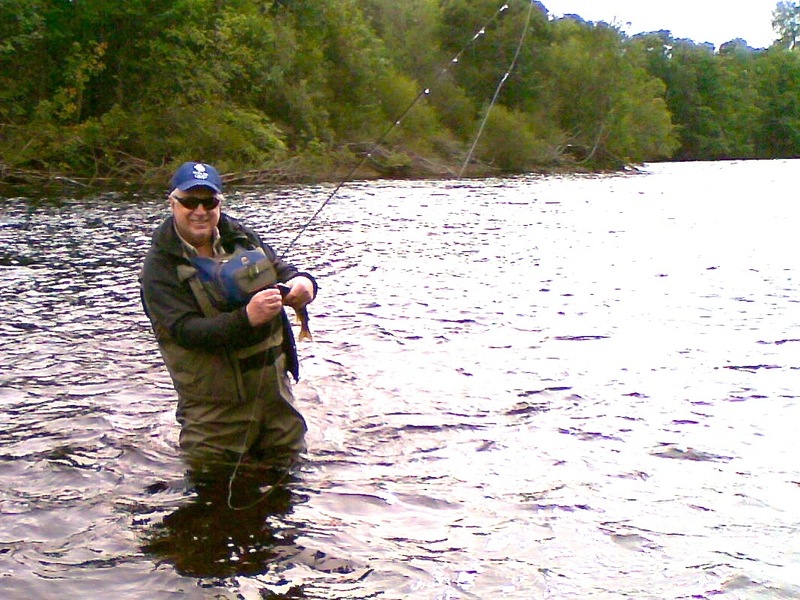 The Dates and venues for this year's Scottish National Fly Fishing League can be found here. Initial details have been issued by Wales for the International Stillwater Championship 2012. The event will take place from Sunday 14th October(arrival) to Thursday 18th October(departure). Venue will be Garnffrwd Fishery, Llanelli. The dates, venues and application forms are now available on this website under Competition Angling, Stillwater 2012. The final this year will be at the Glen of Rothes Fishery on Sunday 8th July. Selection for the 2012 Scottish Stillwater Team to compete in Wales later in the year will be decided at the final. The Scottish Government has published a consultation document concerning the Aquaculture and Fisheries Bill. Please forward any comments to the webmaster. 3 anglers qualified from this evening heat, where despite the midge attack the anglers did well. The three qualifiers are John Anderson Snr, Chris McCallister and Tommy Graham. 41 anglers have qualifed now for the final to be held on Sunday 8th July. The full list of qualfiers and details for final will be issued shortly. The Scottish team for the International to be held in Wales in October 2012 will be made from this final. The top 6 rods and a reserve will be selected. The Board of SANA is pleased to announce that with effect from the 11th June, the appointment of Andrew McIntosh from Perth as it's new Secretary/Administrator. Andrew lives in the Perth area and takes over the position from Alastair Wallace who has held the post for almost twelve years, he will be leaving at the end of June. Andrew has a lot of previous experience and is well placed to take up the reins with his background including work in the insurance industry. He is also an angler and is well placed to understand the various issues facing the Governing Body. 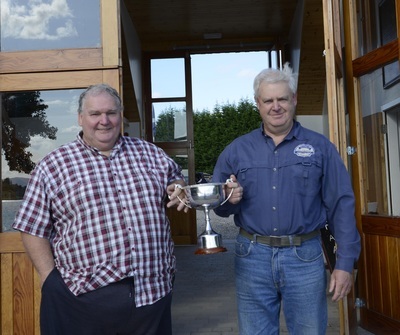 Scotland Disabled Fly Fishing Association won Gold medal at the 33rd International Disabled Fly Fishing Association Championship held at Lake of Menteith on 19th and 20th June. This is 3rd year in row Scotland have won Gold. Bill Barnes was overall top rod. Bill Barnes total for 2 days was 16 fish for 34lbs 11oz. Competition was 3 fish weighed and 2lb bonus for each fish returned. The Scotland Team were Jim Crawford(Capt), Bill Barnes, Willie Brash, George Bell, Tony Lithgow, Ossie Smith, Rab Chisholm, David Penny and Manager Willie Leach. The full results are here. 42 anglers have qualified to compete at the final on Sunday 8th July at Glen of Rothes. The full list of competitiors is here. All anglers are to register at 8.30am, there will be a rules briefing at 9am and competition will commence at 9.30am. Lunch will be provided bewtween 12.30 and 1.30pm when afternoon session will commence, finish at 4.30pm. The cost for the final is £25 per angler inclusive of lunch. In addition to the competitions rules, which are available here, the following Local Rules will apply: No lures to be fished under indicator, a buzzer with a tail will be classed as a lure, these can be used but not under an indicator. No snake flies allowed. Alastair Wallace has been SANA Administrator and Company Secretary for 12 years. Today, 29 June 2012, is his last day in the office as he heads off to a very well deserved retirement. The last 12 years have been diverse, challenging, busy and always 'interesting'. Alastair has remained unflappable, courteous and cheerful throughout, dispensing wisdom and sound advice in equal measure to all. He has touched the lives of innumerable anglers, Scottish and otherwise, and has been a very good friend to all. SANA has received a number of messages to mark Alastair's farewell. Please email any farewell words you may have to the webmaster. From Heat 1 there were 7 pairs progressing( 2 pairs with 7 fish each and each pair had equal first fish times) and from heat 2, 4 pairs progressed to final. From Heat 1, 12 individuals qualified (again time of first fish was used for those on 3 fish) and from heat 2, 4 fish was the cut off. Winners and Team selected for Wales 2012 from Scottish National Stillwater Final 8th July 2012 at Glen of Rothes. Kevin Andrews is the new Scottish National Champion. 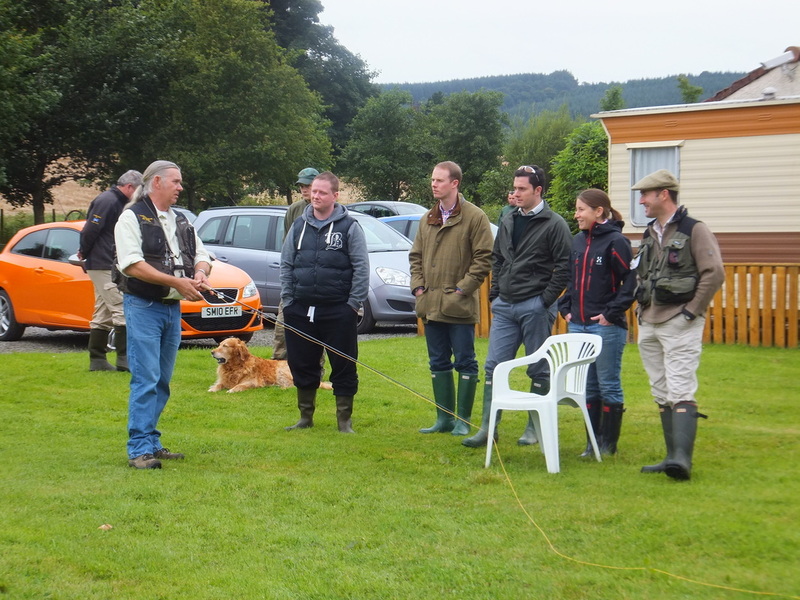 37 anglers competed at Glen of Rothes Fishery on 8th July. In very demanding wet conditions in the morning clearing in the afternoon Kevin caught fish at 10 of his 12 pegs to win with 21 points. The Scottish team chosen and invited to compete for Scotland at the 3rd Stillwater International in Wales in October are Kevin Andrews, Alec Bowler, Steve Corsar, David Bullen, Steve Cowan, Richard McHattie and reserve Jim Adie. Many thanks to the fishery owners Kevin, Dave and all the helpers at Glen of Rothes. Saturday 7th July saw 3rd heat of Scottish National Fly Fishing( SNFFL) League Premier Division. SANA's MFC has submitted an agreed position on the proposed North East of England net limitation order to the Department for Environment, Food and Rural Affairs. The SANA submission is available here. SANA Competitions are looking for new members for their Scottish National Fly Fishing League (SNFFL) 1st Division. Details are available here. The league is now open to all anglers who have the desire to compete, learn and perform at the highest level. If you are interested in joining please complete the application form which can be found here. Acceptance into the League will be confirmed by SANA Competitions Committee. Here are the Provisional results for the final event of 1st Division of Scottish National Fly Fishing League. The final Provisional leaderboard identifies anglers who will gain promotion to the Premier League 2013. These will be confirmed after the final event on 29th September Premier League. Here are the results from the heat for the 1st Division on the Clyde and year to date Leaderboard. Here are the results from the 1st Division River Don heat held on 5th August and the year to date leaderboard. Here are the results from the final SNFFL Premier Division event from River Tummel on Sunday 30th September and leaderboard. The Autumn newsletter can be viewed here. In addition please help by reading the following letter on Inland Cormorants. If your club can help please ask them to complete the survey. Scottish Disabled Fly Fishing Association have held the first of hopefully regular taster sessions with injured army personnel from 51st BDE Personnel Recovery Unit. The purpose of the day was to introduce a meaningful activity to injured, sick and wounded soldiers across Scotland. 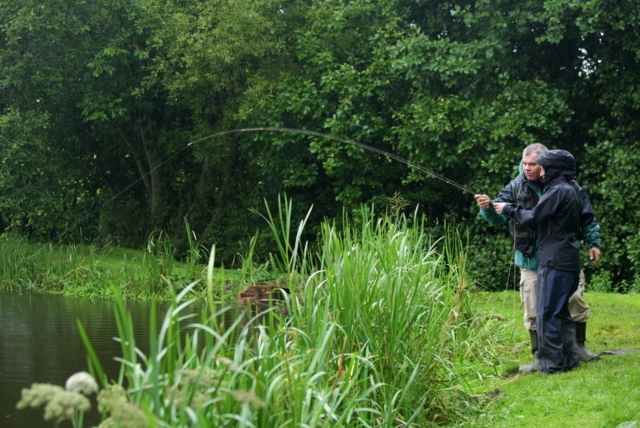 The first taster session was held at Swanswater Fishery on Friday 31st August. John Hood attended as coach and there was support from SDFFA Chair Jim Crawford and committee members Iain Murray and Fraser Renwick. Local Coach Iain Lohoar helped out as well. Despite some unfortunate weather at lunchtime the rest of the day was clear and everyone enjoyed themselves. Our thanks to Alasdair and Morna Lohoar as hosts, for letting us use the fishery and for the excellent lunch. Feedback from the novices was great, most enjoyable and hopefully we have introduced some new anglers to fly fishing. With a little bit of help fish were caught. SDFFA plan to use this as a start to further sessions where we can assist any service members. Most of these soldiers will be medically discharged from the services soon and hopefully the introduction to fly fishing will allow them to meet new friends, socialise and understand that they will always get a warm friendly welcome from the game angling community. Some photos of the day are attached. Here are the provisional results for the SNFFL Premier League held on River Don on Sunday 19th August and with one event to go the year to date provisional leaderboard can be found here. The top 5 in the league after the final event will be invited to represent Scotland at the World Championships in Norway 2013. Congratulations to Graeme Connelly(right) and Ewan Clark who in their first attempt are the 2012 SANA Open Pairs Champions. Graeme and Ewan had 15 fish on the day. Graeme was the winner of the singles with 10 fish. 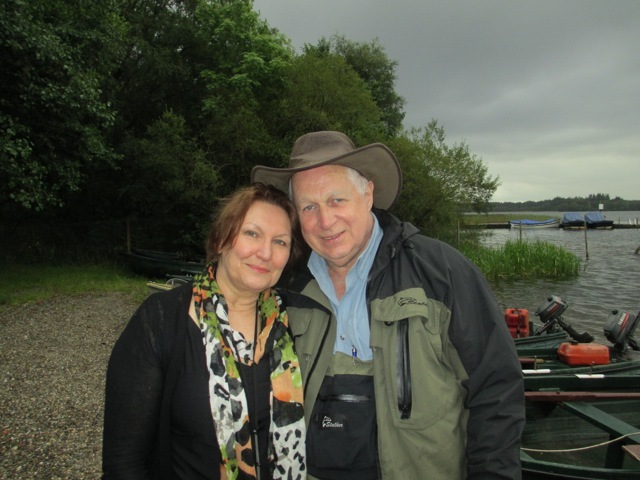 Australian angler Alan Madden left East Kilbride in 1964 but returned to Scotland a few days ago for a holiday with his wife, Irina. Alan was keen to catch a trout on the fly in his native country, having taken up fly fishing only 4 years ago in Australia. He contacted SANA through the Facebook page looking for some assistance and advice to help him in his quest to catch a fish. Webmaster David Ogg took up the challenge and arranged to have a day on Lake of Menteith with Alan and for Alan to fish the Tummel and the Clyde in the company of SANA member Neil Sinclair. 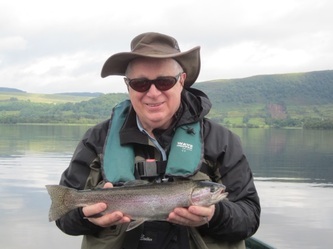 The day on the Lake was on Monday 20 August and Alan was delighted to catch a fish with his first cast! Another fish of 3 lb 4 oz followed, and while that was the end of the catching for the day, David and Alan had a very enjoyable day afloat - discovering that they both attended the same school in Hamilton! Meanwhile Irina explored the Priory on Inchmahome and took some marvellous photos and videos, which she had edited and transferred to her iPad by lunchtime! SANA is delighted to have been able to help Alan in this way - look out for a further report on the river trips. News of a court victory for Tummel anglers here.